You may be wondering why we would throw two shows on Friday night. Well, I figured that the Relapse Records-heavy-BBG bill at Fontana’s was different enough, and far enough away (Manhattan vs Brooklyn), that it wouldn’t matter. Not to mention the combined capacities of the two parties is less than even one show at Music Hall. The loft show literally holds less than 100 people aka space is limited. It costs $8 at the door, there will be beer and wine for purchase inside, and if you want to go, you should send an email to loft.rsvp@gmail.com with your name. Those who email will get an immediate confirmation that they made it on to the list, followed by directions to the Williamsburg (Bedford L area) location on the day before the show. RSVPing gets you on the list and gets you the directions, but entrance will still be first come, first served based on capacity on the actual night of the show. To guarantee admission, show up early. We’ll tweet the capacity status throughout the night as well. The Dutchess & The Duke are playing two shows that same night. From the loft, they’ll head to the Vice party at Public Assembly. One night later you can catch them at the official Sub Pop & Hardly Art CMJ showcase at Mercury Lounge. 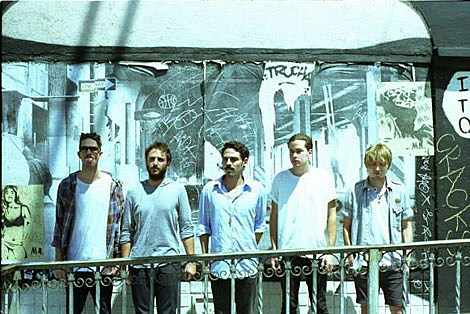 Local Natives are one of two bands playing two BrooklynVegan parties this week (the other is The Wheel). They also appear at the free Saturday day party at Pianos (full details TBA). The Saturday party is one of two BV day parties at Pianos this year. The other is on Thursday afternoon (details also TBA) which is the same day Local Natives play the Aquarium Drunkard party at Fontana’s which is the location of the BV day party on Friday (say that all 5 times fast). The Love Language just signed to Merge Records. The loft party is NOT an official CMJ show. It is the only show Blacklist is playing during CMJ week. The Loom / Secret Garden, part 2 from hoovesontheturf on Vimeo.